B Throwsnaill's doggerel: Hemlock and the Maker's Fire Released! 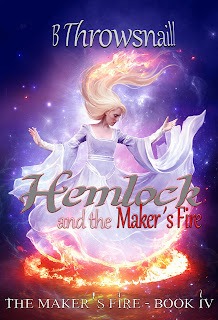 Hemlock and the Maker's Fire Released! Finally! After almost five years, the fourth book of The Maker's Fire series is complete! It is currently live on Smashwords and pending on Amazon. I will announce when it hits Amazon and the other major channels (via Smashwords). Here is the Smashwords link: Book IV on Smashwords . UPDATE: Amazon link is live: Book IV on Amazon . If anyone would like a free review copy just email me.